My hometown is an agricultural community named Clarksdale, Mississippi, at the intersection of Highways 61 and 49. If you know it at all, it’s as the home of the Delta blues, the droning, driving 12 bars of pain and joy that sprang from the surrounding plantations. Whenever I hear that music, it takes me home, and when I listen to it in Clarksdale, it feels like it is being played by the land itself. It’s spiritual to hear Muddy Waters near the fields where he worked. I love driving through the Delta, which is as flat as Montana is tall, especially in the last hour of daylight. The sun hangs big and low and makes the fields and collapsed shacks and faded mansions glow a brilliant gold. All of it seems anointed or ready to be burned, at least it did through the windshield of my car, as I took the familiar roads of my youth away from town and out into the country, where we used to go work in the fields and ride to bonfire parties or just circle the turn rows and gravel cut-offs and dream of escape. My wife Sonia and I rode through that world last year, as I remember it all again, headed out toward an old Italian supper club on Moon Lake. It was early summer, the cotton small and fragile in its rows. With the car windows rolled down, the air smelled like the river. The ruins of the casino Tennessee Williams wrote about still hovered in the shadows if you knew where and when to look. We’d come home to the Mississippi delta to bring our new baby to visit her grandmother and to unwind for a few days. We’d come to Clarksdale because when I’m really tired or beaten down, there’s nothing like home to put me back together again. I’d been on the road for months straight if I thought about it one way or for the past 20 years if I thought about it another. When I first left my hometown, I was determined to see the world, all of it, and that’s what I’ve been lucky enough to do in my job, from pool halls in Argentina to forward operating bases in Iraq. That was my dream, and it’s come true: I’ve been nearly everywhere people play and watch games, everywhere they look for freedom with a ball in their hands or at their feet, everywhere people invest complicated, tribal ideas of home and family in sporting events played by strangers. Sometimes the individual dispatches feel like exhaust fumes from an ongoing, overarching search. Over the past months, I’ve been forced to consider my motivation for this search, as Penguin prepared to publish a collection of my ESPN stories. I named this collection The Cost of These Dreams, after a Drive-By Truckers lyric that always resonated with me. Looking at more than a decade of work stripped down to its essential parts naturally led to some sort of self-examination of how this all came to be and what there is to be learned from reading about sports. I’ve long wondered how to sum up stories that mean more to me than I can reasonably explain without embarrassment. As I talked about it with Sonia, she told me something I’d never heard her say before. It didn’t really surprise me; in our marriage, besides being a full-time magazine editor and my first and most important reader, she’s also had to put up with me. She said she had often viewed herself as a corner man in a boxing ring. Her job in between my reporting trips was to calm me down and squirt water in my mouth and fix my cuts and bruises and get me in reasonably good enough shape to go back out and fight another round. To me, the title of this book was a piece of connective tissue between the people and places I’ve written about. So often I crawl around in the lives of men and women who yearn for a different kind of self and future and pay a price for that yearning. But to Sonia, the title was about me. So often I crawl around in the lives of men and women who yearn for a different kind of self and future and pay a price for that yearning. I remember the first time I read Gary Smith’s letter from the Pine Ridge Reservation, a parable about the power and limits of sports to provide an escape; and when I discovered Frank Deford’s profile of Bobby Knight, which was true when it ran and only got truer with the passing years; and what I understood about the importance of cutting through myths to find something real when I read Charles P. Pierce’s story on Tiger Woods. I learned about ambition, including my own, when I read Richard Ben Cramer’s masterpiece on Ted Williams, and in Gay Talese’s profile of Joe DiMaggio I found a reflection on the fleeting nature of fame and greatness—what relief it brings those who burned themselves chasing it, and what pain it can’t begin to touch. Those of us who write these kinds of sports stories, which feels like an ever-shrinking pool, are not after the symphony of a novel, or the jazz improv of a poem, but the hard, rough gut-punch of a blues song. When I was asked to write an essay—a version of which you’re reading now—to explain how these stories fit together, both in my own head and in the tradition that inspired them and me, those great pieces I’ve read came to mind. If my book has an organizing principle, then, it is this: The literary magazine sports story is a minor but vital form of uniquely American art. I get upset when people don’t learn the canon or hold the line on matters of ethics, ambition, and work ethic. That’s what I owe those who came before and what I owe the version of myself who wanted so badly to be good at this. I never want to shortchange them, or me, or the form. Maybe that’s what Sonia meant when she described the cost of my obsession and her hope that I might learn something about myself from all the myopic, hyper-driven people I’ve written about for the past two decades. From Pat Riley we learn how far and fast a man will run to escape something in his past, and from Tiger Woods we learn the dangers of living both a private life and a public life at the same time, as one almost inevitably consumes the other. Over and over we learn the value of a selfless father and the dangers of a selfish one. From Michael Jordan we learn the benefits and costs of a man constructing himself into the perfect machine to manage the first 40 years of his life while creating a version of himself completely unsuited for the next 40. That’s a universal truth: The tools required to gain greatness often prevent someone from enjoying it. From Ted Williams and his family we see the multigenerational inheritance of pain and how Richard Ben Cramer’s profile documented the rock but not the lake or the ripples. We see Dan Gable use his pain as fuel, later finding it so hard-wired into his daily life that he struggled to put it down once its usefulness has expired. We see all these people, and maybe we steal a glimpse of ourselves. My love of this craft began at the University of Missouri, where a group of us debated and dreamed and wondered how the stories we loved came to exist. But the ideas that drove me to need a craft began much earlier, on the streets just outside the plateglass window where I found myself sitting the morning after Moon Lake, in the corner of a coffee shop on Yazoo Avenue in Clarksdale, four or so blocks from the house where I grew up. So many of these stories are about understanding a real world hidden behind a facade. Some of them are about deciphering the codes and meaning of home. Some are about people who carry the place of their birth and its gravitational pull with them even as they run themselves out trying to escape. Some are about people who get the things they wanted and must make an accounting of what they exchanged for them. These deep lifelong interests of mine began in Clarksdale, Mississippi. The themes I’ve returned to again and again were first explored when I was a young man, trying to come to terms with the beauty and inequality of the place I called home. In Clarksdale, powerful ideas often relegated to philosophy classes or history books played out in real time day after day. As you grew up, you were taught either to ignore the dichotomy or to train yourself to always see it—to hunt for it—no matter what obstacles are erected to keep it hidden. Becoming a journalist was born from this desire to see things as they truly were and not as so many interested actors wanted them to appear. I understood that people protected themselves with the stories they told about themselves. That urge fascinated me. It still does. The most interesting place exists between how people see themselves and how other people do. That knowledge was born in Clarksdale. It’s funny when I look at the past two decades through that prism, sitting in a coffee shop across from the old offices of The Clarksdale Press Register, where I worked a long time ago. The tools required to gain greatness often prevent someone from enjoying it. For years, I wanted to be successful enough for both of us, to raise up myself and him at the same time. Only since the birth of my daughter, Wallace, have I understood that I have taken exactly the wrong lesson from his death. All his life, I heard him talk about what he and my mother would do together, about the life they’d share, once his own personal race had been run. He died before those dreams were realized, and now I’ve come to slowly realize that success means reaching your goals and enjoying them and that one without the other is empty and meaningless. Not long ago, I went to the funeral of the legendary sportswriter William Nack, and as his kids talked about how much they loved vacations with him, and how much he loved his family and enjoyed cooking big meals for all of them, I realized that his work was a means to an end. I have made a career by exploring all the things that fascinated me as a boy. College students often ask me how to succeed in this business, and I’ve given a lot of different answers, some about craft and some about work ethic, but the real answer is that you must be curious and then stay that way. You must remain amazed at people and places and then forever push yourself to transmit that wonder in more and more powerful and accurate ways. I grew up in a place unlike other places, with its own music and food and history, where grown-ups saw night and called it day, where people were capable of great kindness and great cruelty, sometimes the same person capable of both. I learned as many lessons working in the cotton fields for Cliff Heaton and Freddie Gordon as I did in classrooms. Everything good that’s happened to me in my work life springs from Mississippi, from the little town that still feels like home. I think back to a car ride through the Delta, all the car rides, headed out to get a steak and drink from a bottle of whiskey and listen to Muddy Waters singing about champagne and reefer. The past stays with us. I can see it now. The sun is golden and hanging low. The fields stretch out on either side of the blacktop. Everywhere around me, there are furrows and river bends and oxbows and lakes and marshes and swamps and white clapboard churches and beer joints and a hot mean sun, all timeless, weightless, airless—infinite. I see a road that leads out to the world and also leads back home again. 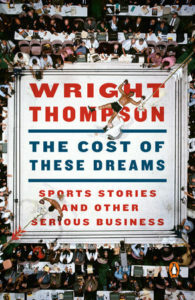 Adapted from The Cost of These Dreams: Sports Stories and Other Serious Business . Used with the permission of the publisher, Penguin Books. Copyright © 2019 by Wright Thompson.